Inherent features of the new S4 Jackets Autumn/Winter Collection 2018. Not only does this represent a continuation of true S4 Jackets tradition, it also goes one step further. Always straightforward. Always casual. And always 100% innovative, confident and masculine. With the new collection, the modern gentleman is sure to find what he’s looking for. A classic pea coat and smart single and double-breasted wool coats from European manufacturers have what it takes to stand out, as do our sporty, elegant jackets and classic waistcoats whose straight, clear silhouettes carry all the conviction of all-time favorites. The urban lifestyle of international metropolises finds expression in this year’s autumn /winter wardrobe. A certain aspect of athleticism is an integral part of any attractive and successful man. As far as this sporty side is concerned, S4 Jackets AW18 covers all bases with its Retro Sports and Athleisure Wear lines. Casual, bulky quilted jackets in shortcuts go head to head with fashionable medium-length and long parkas with stylish fake-fur trims on the collar. Always authentic, always masculine. Modern field jackets and sporty bombers are both at the forefront of fashion – how about looking forward to winter for a change? 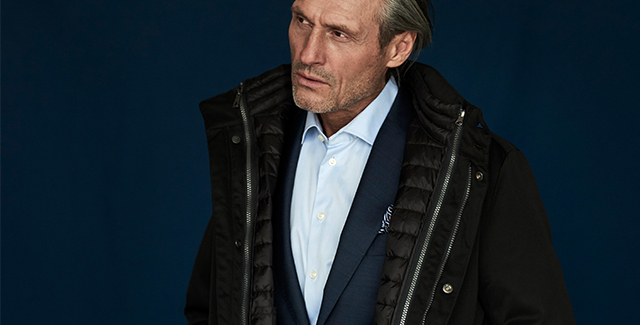 Distinctive nuances of blue and elegant melange fabrics are setting the tone this season: from cool ice blue and sapphire to dark navy and elegant shades of grey, spanning silver to anthracite. Warm, natural tones add to the colour concept, reflecting milder autumn landscapes before the break of winter. Brown, both plain and in a wool look, as well as copper and bronze, are central to this theme. The trendy retro sport colours red, white, navy and black are also in force to underline the Athleisure theme. For a sporty look with style. The focus is on colour mixes and colour blocking in a modern interpretation of the timeless, clean contours of the Bauhaus movement. 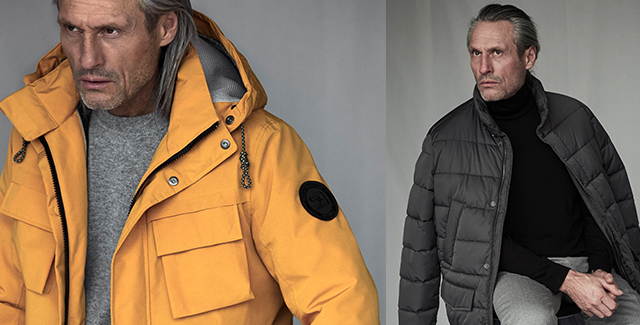 S4 Jackets AW18 looks always simple, never over the top: somewhat in contrast to the overcharged world all around us. Another source of inspiration is the clear, geometric patterns of Art Deco, giving the lining materials a sophisticated note. Advanced textiles with functional technology guarantee a confident look as well as the means to battle through any storm. And we aren’t satisfied with that: genuine down and PrimaLoft padding ensure uncompromising warmth and excellent comfort, even on icy days. Windproof, rib knit cuffs on the sleeves and high-fastening stand-up collar designs also contribute to that. 100% protection, even in the heart of winter. No matter if you’re on your way to work or taking a relaxed walk through town. Let the cold times come! The outer fabric loses none of its usual smartness, either. With a twill texture or elegantly textured Dobby Weave. As far as patterns are concerned, shadow checks and bouclé fabric emphasize a very classic modern look. Mini patterns and prints serve as subtle yet striking highlights on the lining materials. Premium, richly coloured outer fabrics with a medium-gloss finish are a popular choice and guarantee a clean and understated, yet nonetheless elegant, look. Perfect for the modern man who wants to nurture a happy-go-lucky vibe without coming off as too showy. Because less is sometimes more. The innovative material mix unites the twin disciplines of style and function. No compromises. The focus is always on what counts. High-quality wool fabrics and exclusive leather join forces with functional nylon. These ripstop fabrics can bear the brunt of any weather. Stretch cotton and super lightweight stretch fabric with Flexxx Fit guarantee maximum comfort and mobility – even if it means breaking new territory. Because that’s what S4 Jackets is all about: going our own way. Uncompromising, stylish, confident. 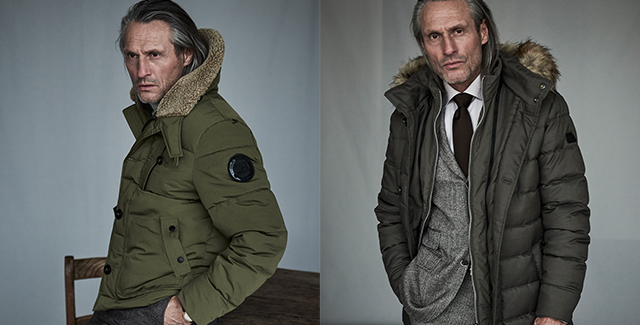 S4 Jackets AW18 – 100% man.